In Canada in 2015, Alzheimer’s disease and related dementias were the second leading cause of mortality, responsible for 12% of deaths, the third leading cause of premature mortality and the fourth most significant health burden. Cognitive impairments have significant economic and health impacts for informal caregivers. They also have implications for the use of community, social and health services. In 2016, the annual cost to Canadians of caring for people with cognitive diseases was estimated to be at least $10.4 billion. Aging in itself does not explain the development of mild cognitive impairment or a major neurocognitive disorder. The cumulative effects of genetic inheritance and especially of the life course contribute to the strengthening or weakening of cognitive health. The brain has the potential to adapt to threats to its functional abilities. Given the presence of favourable conditions, it develops over the life course a cognitive reserve that allows it to function better and to develop adaptive abilities. It then becomes less vulnerable to the effects of age-related cognitive decline and can offset the pathological damage that occurs with the onset of major neurocognitive Alzheimer’s-type dementia. There are levers for acting upstream both to foster cognitive health and to protect it by reducing known risk factors. Once an advanced age is reached, the combined effects of these levers have major impacts for seniors and their loved ones. The factors that contribute to the development of cognitive reserve are education, particularly education early in life, sustained cognitive stimulation throughout life and the adoption of a physically active lifestyle. Other factors are associated with the development of cognitive impairments, especially certain risk factors for cardiovascular and cerebrovascular diseases, including smoking, high blood pressure and diabetes. Countries like the United States (2007) and the United Kingdom (2014) have made cognitive health a priority public health issue. Thus, for example, the United States has established and gradually implemented a program of activities aimed at detailing the current state of scientific knowledge about the subject as well as current perceptions within the populace about how to protect and improve their cognitive health. The United Kingdom officially recognized cognitive health as a national public health priority in 2014. Since then, multiple partnerships have been established with the aim of addressing this issue. 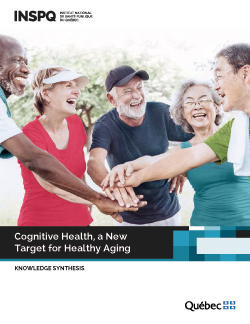 The implementation of a large-scale campaign to raise awareness about cognitive health among adults aged 40 to 60 years has also been placed on the agenda.